Michael's first large whale project was the articulation of this 60 foot fin whale that was struck by the cruise ship Galaxy in 1997. This articulation is mainly internal with the exception of a minimalistic external framework for the whale's heavy rib cage. The skeleton continues to tell its story as most of the extensive damage to its vertebral column at the site of impact is still visible. This fin whale has been suspended at the Killer Whale Interpretive Centre in Telegraph Cove, B.C. With massive jaws agape, the whale powerfully lunges through a school of prey, steered by extended flippers and with its tail on the verge of a powerful downward thrust. Ship strikes represent one of the greatest threats to large cetaceans in our oceans. The skeleton of this mature bald eagle is internally mounted and suspended by thin stainless cables. 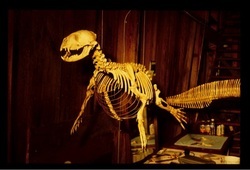 This skeleton is on display at the Killer Whale Interpretive Centre in Telegraph Cove, B.C. This male harbour seal has been mounted internally and is suspended by thin stainless cables. He is postured while swimming at the surface, head extended above the water, curiously checking out his surroundings. 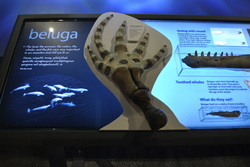 This skeleton is on display at the Killer Whale Interpretive Centre in Telegraph Cove, B.C. This flipper is articulated on a sturdy steel internal framework and specially prepared so that it could be mounted as a touchable display. Several bones were missing from the collection and these needed to be replicated by hand. The cartilege was re-created and painted to look entirely natural. This beluga flipper is part of a larger beluga interpretive display at the Prince of Wales Northern Heritage Centre in Yellowknife, N.T. This section of caudal vertebrae was dragged up from a deep ocean resting place near Ucluelet. We believe that the bones are likely from a blue whale. The section has been installed on thin stainless wire in Dr. Jerome Fryer's chiropractic office in Nanaimo and appears to be floating when viewed from the street below. Dr. Fryer builds beautiful human spinal models and will be using this display of whale bones for education. ​The body of this old male sea otter was found on the coast of Calvert Island by a team of researchers monitoring changes in local ecology with the reintroduction of sea otters to our coast. He'd likely died from a tooth infection. He is internally articulated and hung from thin stainless cables at the Hakai Research Institute on Calvert Island. His skeleton has been articulated just as he is coming out of his foraging dive and about to twist belly-up and swim to the surface with his prey. Between his front paws, he grasps a large sea urchin test, the skeleton of one of his favourite foods. For more on this project, check out Smithsonian Magazine. ​The 100-year old articulated skeleton of a blue whale that has hung in the London Natural History Museum's whale hall for decades was disarticulated, restored, re-articulated and moved to the museum's main exhibit space in 2017. Mike joined a team of articulators in London to help them design the new exhibit and fabricate the mount of this massive whale's skull and lower jawbones.